A news editor described as the “heart and soul” of a regional daily has died aged 49 after a long battle with brain cancer. Tributes have been paid to Nick Machin, pictured, who spent three stints with the South Wales Echo. 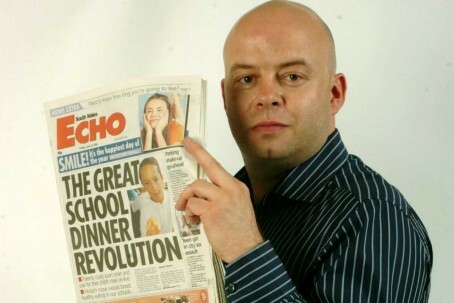 Nick originally joined the Cardiff-based Echo as a reporter in 1998 and left an “indelible mark on the paper” as its news editor, according to Media Wales editor-in-chief Paul Rowland. He died on Thursday after a long battle with a brain tumour. In an obituary for his friend and former colleague, Paul wrote: Quite simply, Nick was the heart and soul of the South Wales Echo for the many years that he worked there. “On any given day, he’d generally be the first to arrive and the last to leave. He’d know every last detail about every last story, and he lived his professional life by the mantra that if something was worth doing, it was worth doing properly… and then double-checking one last time for good measure. “I worked with Nick for the best part of 10 years. He was my boss, my colleague and my friend. In the third of his three stints here, I was his boss. “He was as wonderful working for me as he’d been to work for himself. A true professional, and a pleasure to deal with. No matter what the task, he did the job with a smile on his face, a mug of tea in his hand and a joke never far from his lips. “Among Nick’s many qualities, there are two that I admired above all others, and that I’ll never forget. The first was his unceasing ability to take an interest in everyone around him. He always had time for everyone. You’d often find him putting his coat on and heading towards the exit after yet another mammoth shift, only to spot him half an hour later sharing a laugh with the sports desk. Paul listed the second quality he most admired in Nick as bravery – “an asset he has displayed so admirably through his heartbreaking battle with the cruel illness that has taken him from us so soon”. In his tribute piece, Paul described how Nick left Cardiff behind to travel the world and found the love of his love, Sufia, who would go on to become his wife. “Nick had risked everything, and won the jackpot. I’ll never forget meeting Nick for a pint in the White Horse Tavern in New York in 2012. I was on honeymoon with my wife Laura. Nick was over there spending time with Sufia. She wasn’t there that day, but you could see the joy spilling out of him,” he wrote. “As romances go, it was fairytale stuff. The love between Nick and Sufia (and not forgetting their beloved dog, Ellie) was apparent in their whole time together, but never more visible than in the past few months as Nick has succumbed to his illness. Her love, compassion, bravery and determination as she did everything she could for him at such a horrendous time was truly awe-inspiring. So sorry to hear this news. Worked with Nick in Cardiff back in 99/2000 and bumped into him a couple of years ago at an industry bash in London, He was, indeed, a lovely bloke & everything Paul writes is spot on. Heartfelt condolences to his family & friends.